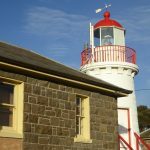 Lady Bay Upper lighthouse sits in Warrnambool’s Flagstaff Hill Village looking down over the bay, with its breakwater and reef. On the Shipwreck Coast. 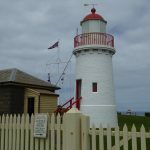 The first thing they’ll tell you about Warrnambool’s two lighthouses is that neither of them are where they were originally built, but both are still in use today, forming a line which ships can use for safe entry into the harbour here. 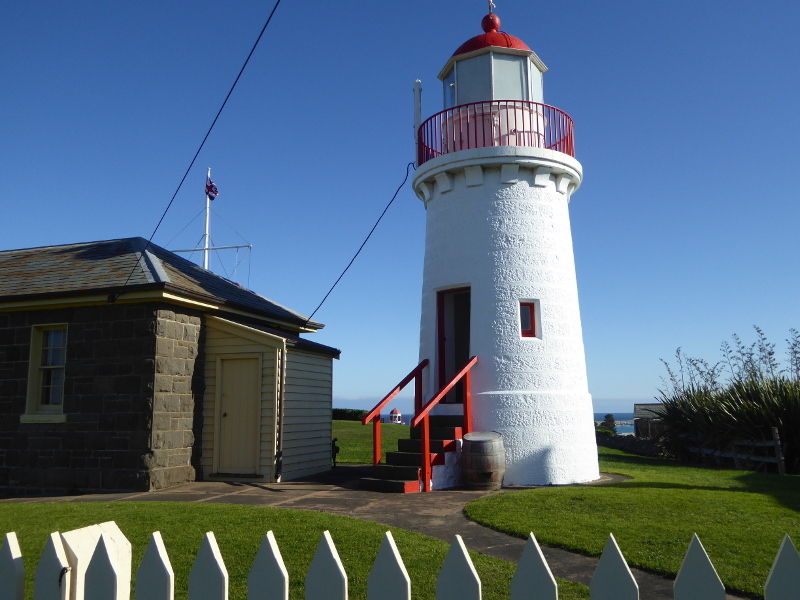 Both of them – the Lady Bay Upper and the Lady Bay Lower – stand in the heritage ‘village’ called Flagstaff Hill, and you do need to pay to get inside Lady Bay Upper, as the whole Village complex is one of those historical reconstructions, with the ‘school’, the ‘blacksmith’, the ‘cooper’ etc lining the winding road down from the top of the hill. I’m not a big fan of these quasi theme parks usually – they are a bit too targeted at kids for my liking, though I do remember loving the one in York when I was a child myself, so in a sense fair enough to have them. 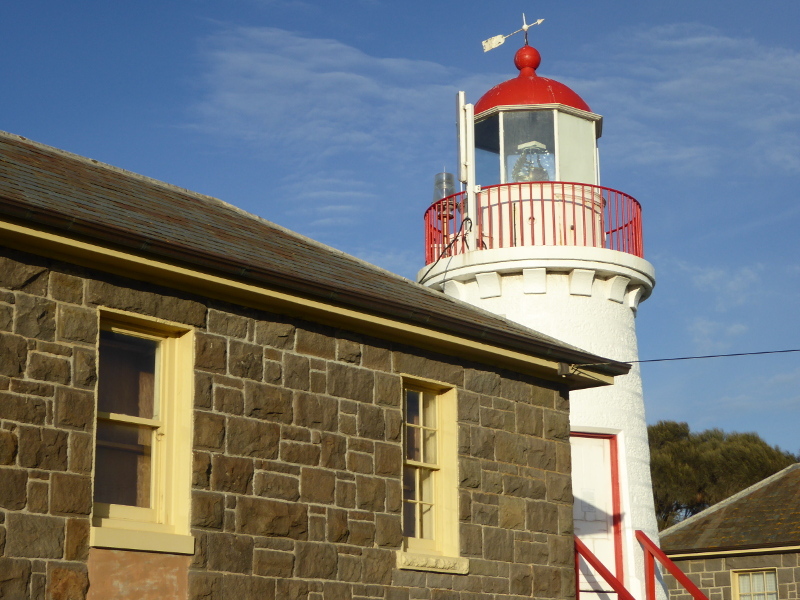 But Flagstaff Hill Maritime Village is actually really worth a visit, and we loved every minute of our hour or so there. 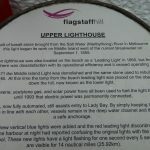 The Lady Bay Upper lighthouse was first built on Middle Island, just beyond the breakwater, but was transferred to the Hill 12 years later, as the light was apparently too often obscured by heavy seas and spray when it was on the island, especially as they didn’t build it to tower up high. We popped down to the breakwater later in the day and saw the waves breaking onto the reef by the island. Even on a calm day, you could see why Middle Island seemed the logical spot for a lighthouse, but also how the spray would easily make the light beam useless for those caught out to sea. The first lighthouse keeper here, who was also the one who stayed in post the longest, must have seen quite a few changes, going from having to row over to town to get to the local dances (see more on this below), to looking down over the harbour from the new vantage point high up on the hill. 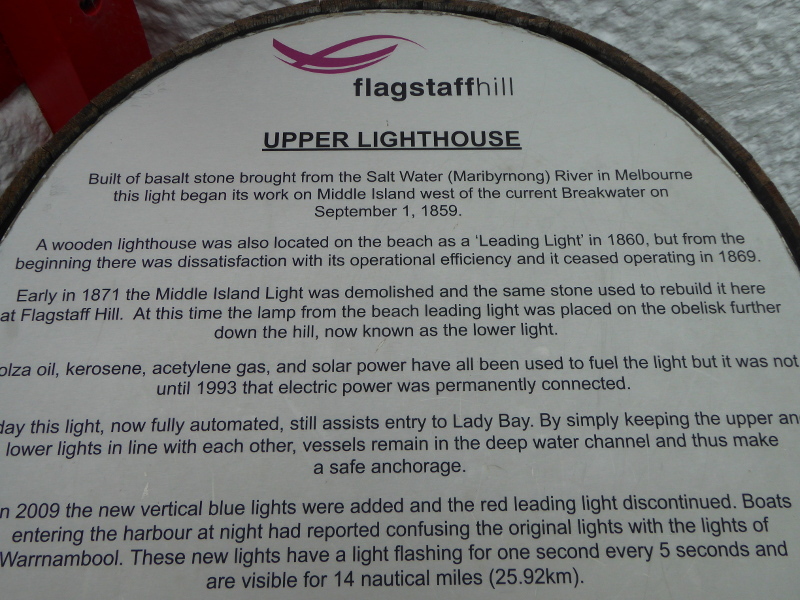 Lady Bay Upper is not a tall lighthouse. 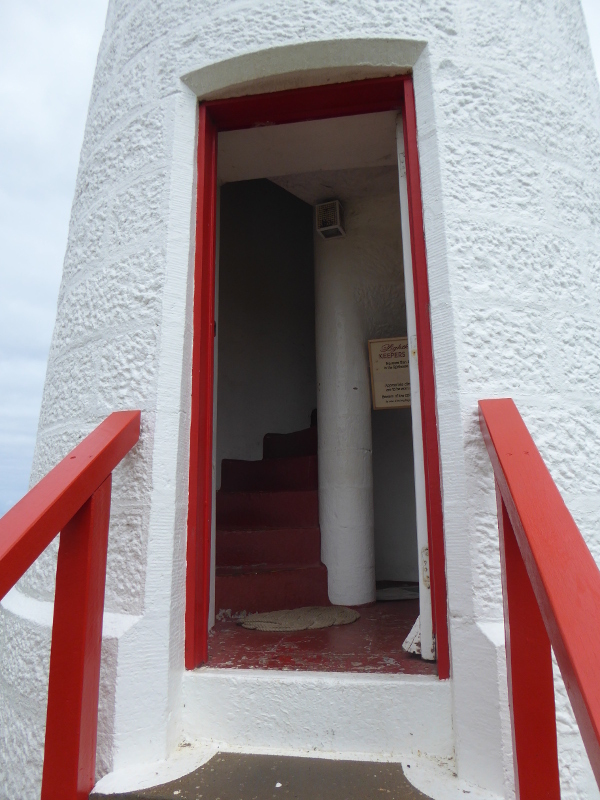 It’s only 22 steps up to the top, and you can still access it today. 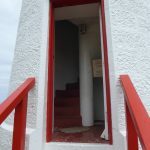 But it’s a fun lighthouse to visit, with little ducts you can open or close to adjust the air flow inside, great views out to sea from the top, and you can press your nose up against the light itself. There’s even a switch up there which made us curious as to whether that actually turned the light on, though we decided not to experiment and try it. 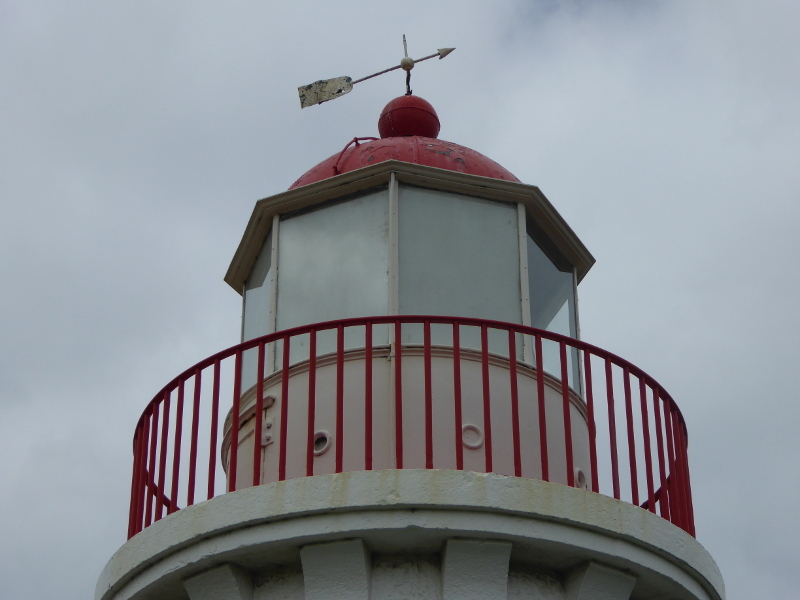 It has a distinctive red staircase and red viewing gallery at the top, with a wind vane, but otherwise a typical white building. It was good to have done my Trove research before coming to Lady Bay, so I could really visualise the World War 1 lady who mistook a whale in the harbour for a German submarine. 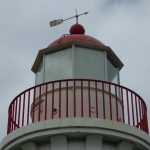 And the story around the La Bella shipwreck is fascinating – I talk more about it under the People heading below, but reading between the lines of the brief summary posted by the front door of the Lady Upper Lighthouse, it sounds as if there are a few divergent views on who should have received the accolades for saving the lives of those seafarers who did survive. There are apparently 14 wrecks on the floor of Lady Bay, and the La Bella sounds like it is the one which got the most publicity when it ran aground on the reef in 1905. 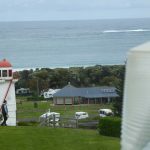 Again, you can see the reef from the lighthouse and it is really close to shore, but must have been so hard to reach in a storm off Warrnambool. The Loch Ard – from Glasgow no less – sank further up the coast nearer Peterborough, but it gets the most attention in the Museum you walk through as you enter the Village complex. 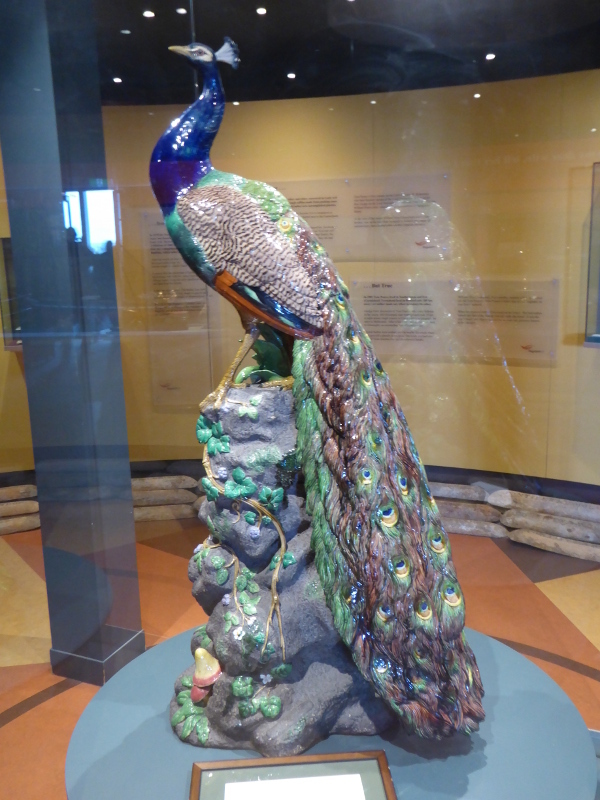 The porcelain peacock is magnificent – made by Minton of Stoke-on-Trent – and worth a pretty penny in today’s money: insured for $5m, we were told! There’s also a diamond ring, which was found on the lintel of a chalice that went down with another ship. And a gold watch discovered strapped to the body of a drowned woman – still marking 4.20am, the time the ship went down. 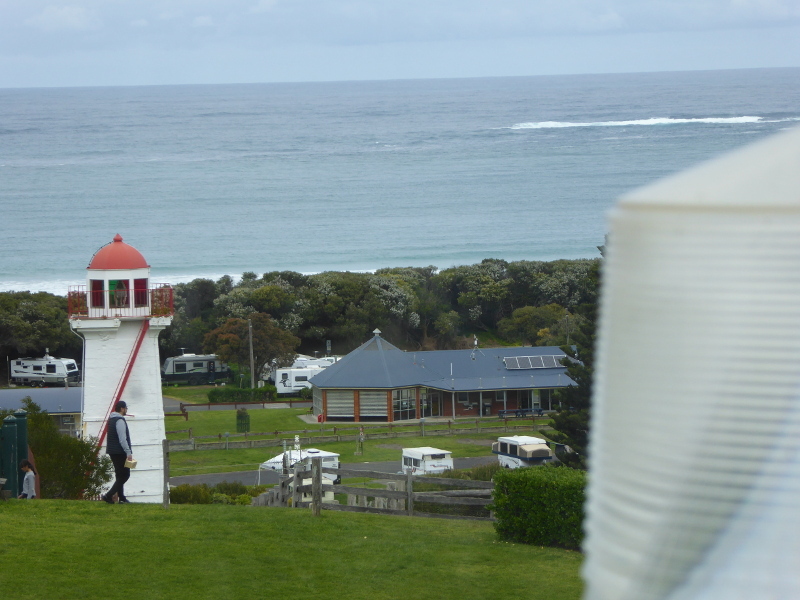 So you can see why this is called the Shipwreck Coast, and why they needed so many lighthouses all along here. There’s more on where to get a bit of lunch (or afternoon tea) below, but as we sat in the tea rooms, we got chatting with Sean, the volunteer ‘blacksmith’ on site, His own story was fascinating, with Irish ancestors, and a great grandfather who was also a blacksmith for real. 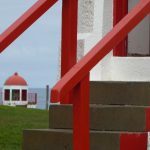 He knew a few of the lighthouse stories, too, so was great to listen to for a wee while as we tucked into our scones and cream. 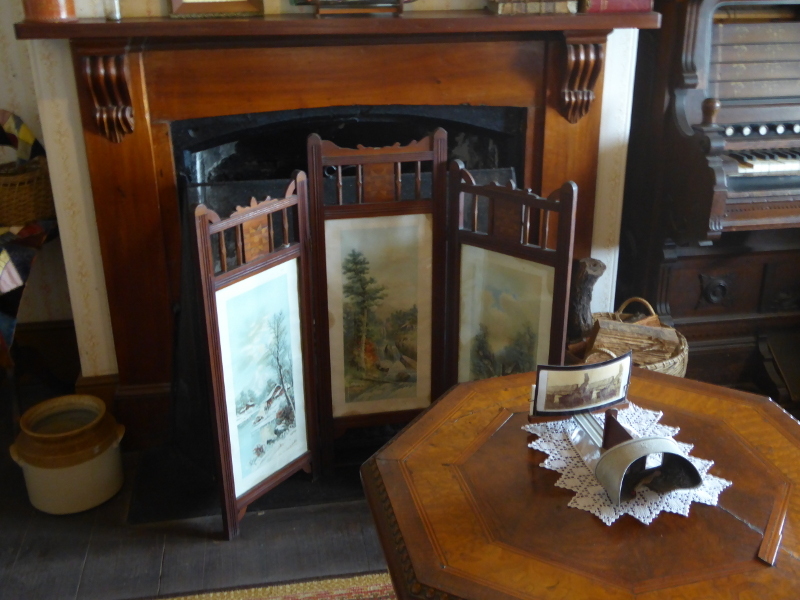 The last section of our visit took us inside the old Lighthouse Keeper’s cottage, which was beautifully laid out, with kitchen, living room and bedrooms (hard to see how they’d have slept so many kids then). 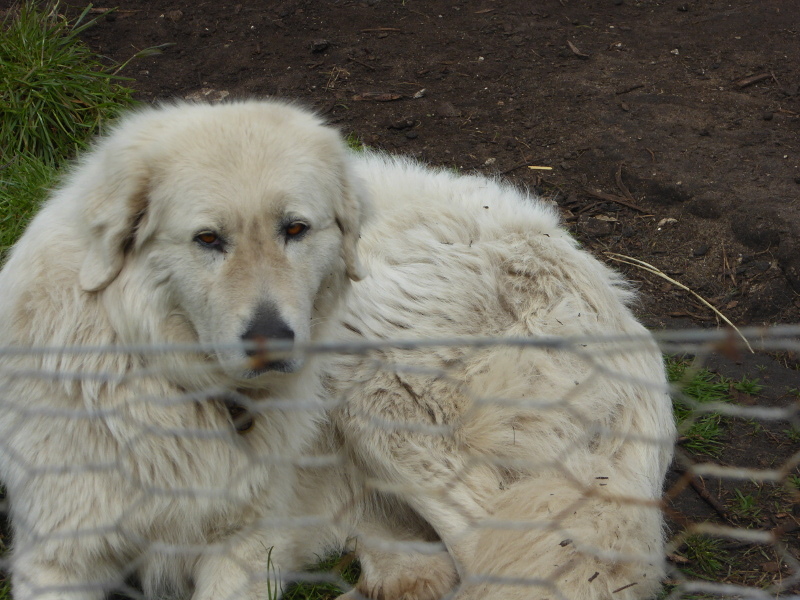 Oh, and we can’t finish without mentioning the Maremma Guardian dogs, who look after the penguins on Middle Island. These beautiful blond creatures wander back and forth at will across the sandbank from the mainland, but basically keep the foxes away from the penguins on the island. 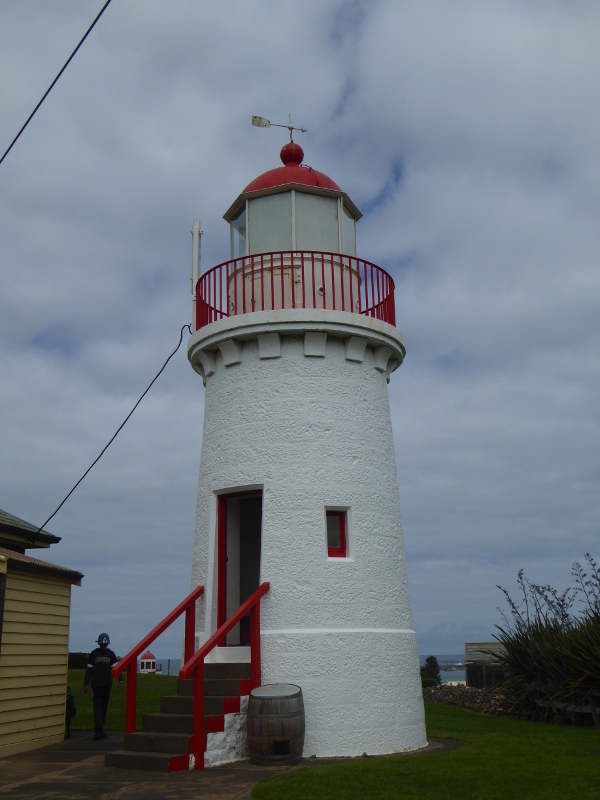 It’s the only place in the world where this is done, and it’s known apparently as the Warrnambool Method. 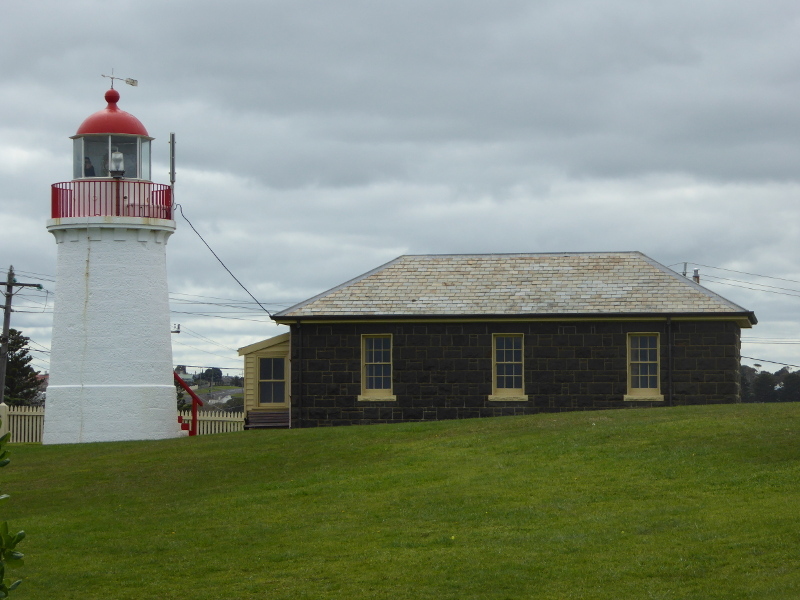 The dogs have rest time on Flagstaff Hill, in a paddock not far from the lighthouse. They looked pretty cuddly and lazy as we walked by, but I wouldn’t fancy being a fox caught in their path over on the island…We spotted penguins sitting on the rocks at the edge of the island and were glad the dogs were there also to keep the penguin population in peace. 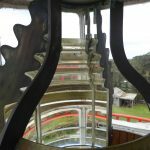 From 1915, with cuts in staff and personnel needed elsewhere, the pilot and harbor master were put in charge of maintaining the light. 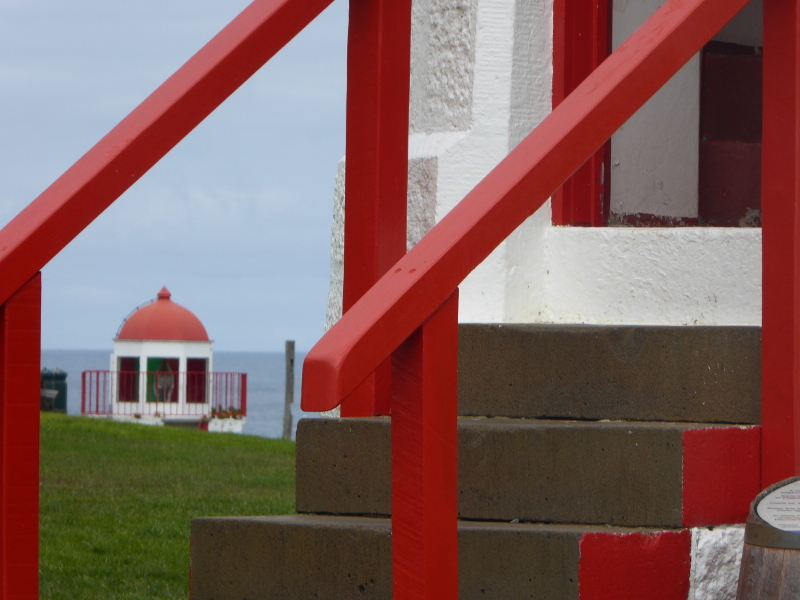 And then after the war, the lighthouse remained ‘unmanned’. 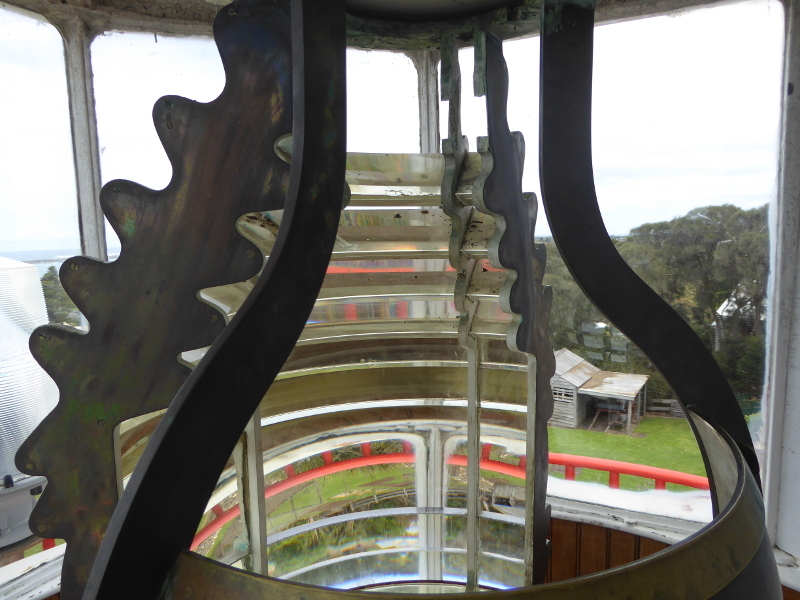 The first lighthouse keeper, Robert Deverill, sounds like he was quite a character. 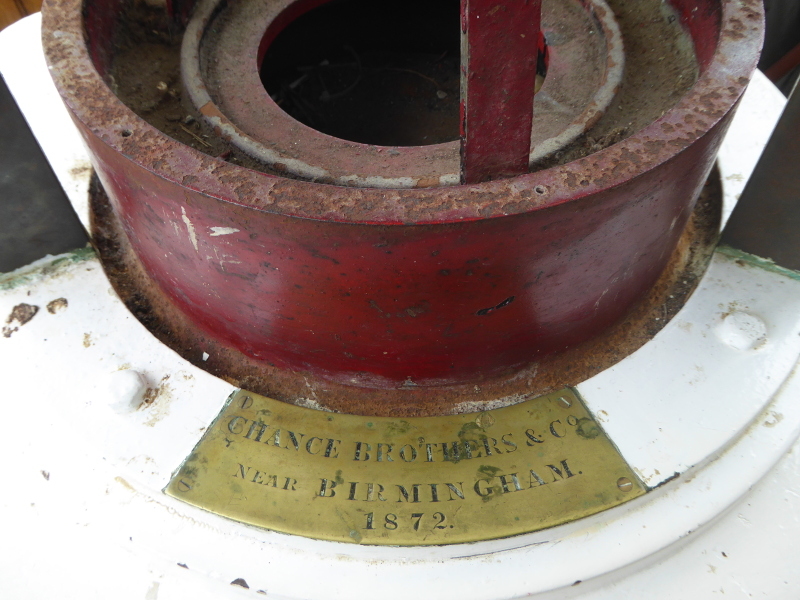 He came over to Australia from Ireland to take up the post and stayed from 1859 to 1885, so quite a stint. 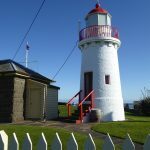 There was also an odd story from 1880, reported in a Queensland newspaper strangely enough: Mr Deverill had apparently sent the newspaper strange globules of ‘gelatinous matter’ which had fallen to ground near the lighthouse, each globule infested with midges or mosquitoes (and each globule up to a quarter of an inch thick! Sounds like a bit of mischief from Deverill. Or if not, what was this and why send it to a newspaper? Basically Ferrier sounds as if he was just a local fisherman who happened to be at the right place at the right time to be able to help. And he did what many of us would like to think we’d do in such circumstances. And it sounds as if thanks to his action some people on La Bella were rescued. The problems seemed to have started in the aftermath. Ferrier became a bit of a ‘hero’ in the media, and received several prominent accolades for his heroism. He doesn’t sound like the kind of guy who basked in the limelight, though, and when there were efforts to make a stage adaptation of the incident for music hall (we’re pre cinema days, of course), he apparently refused to cooperate. 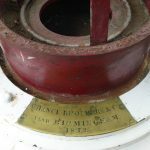 But alongside the hero worshiping of Ferrier, there seemed to be a few small hints that the local lifeboat might have done more. Some questions were asked as to why the lifeboat didn’t take the risks of going in closer in the moment, and waited till the seas had calmed the next morning. So what the lifeboat crew did do in the morning received little or no coverage in the press, and it was only in that faded paper at the foot of Lady Bay Upper that I learnt that the lifeboat actually saved more people than Ferrier. With the benefit of hindsight and not being a local, I can see how easily the publicity would focus on a chosen ‘hero’ and try to undermine official public services (what’s new in the media after all?). I’m sure everyone did all they could and it was clearly a remarkable operation with great deeds done by all concerned. But I can just imagine the small town resentment of one individual who got all the awards – it’s just a shame if ill feeling split a community like that, when actually the overall tragedy was lessened by those who got involved. Reading detailed accounts of the incident, I see the poor people on board died either from exhaustion letting go of bits of ship they held onto, exposure and cold; or washed away when they couldn’t hold on anymore. One man apparently had broken legs buffeted against bits of the boat and just lost will to live. And all this so close to the harbour. 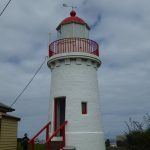 What are your experiences at Lady Bay Upper lighthouse? 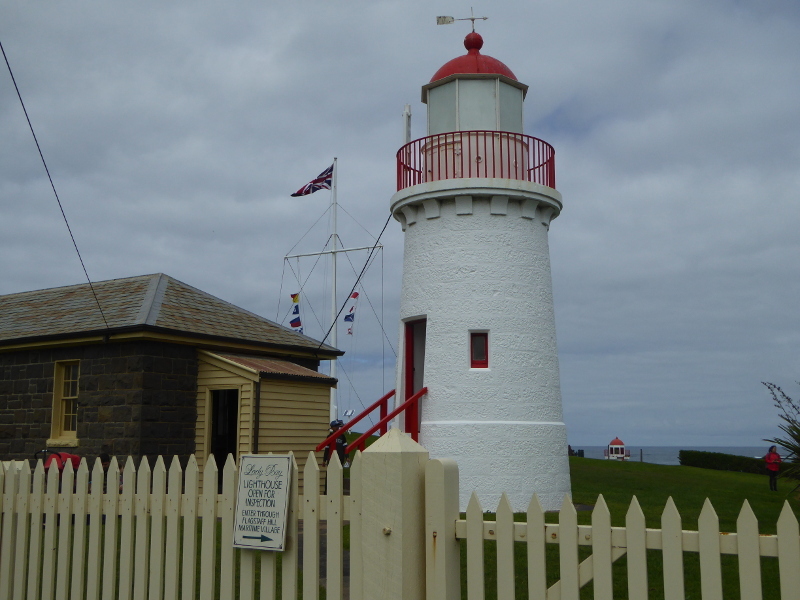 Does anybody else have stories to tell of their own visits in and around Flagstaff Hill Village and especially the lighthouse? If so, I’d love to hear them, so send a comment in below. 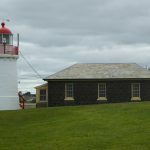 This 50-somethings blog combined a trip to Lady Bay and Warrnambool with an entry also on Port Fairy. This again is the article discussing the problems facing William Ferrier – interview with his nephew from June 2014. Cup of tea after your tour of the village? 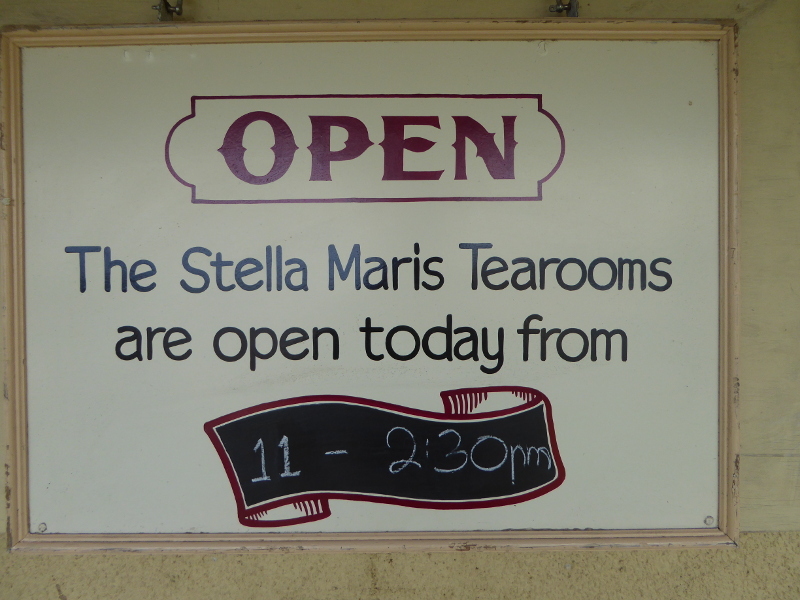 Stella Maris Tea Rooms are well worth a visit if you are in the Village between 11am and 2.30pm. Fantastic home-made scones with jam and cream was my choice, with a pot of loose leaf tea (if you just want a tea bag cuppa, it’s free if you eat here!). Great décor, with a piano you are welcome to tinkle on (mind the missing key, though).